The Cleveland girls basketball team didn't take the bus to Barlow to work overtime. Instead, the Warriors went for the win with time ticking down in the fourth quarter Tuesday. Cleveland's Grace Pytynia-Hillier knocked down her fifth 3-pointer of the night to put the Warriors up 58-57 with 0:12 to play. Instead, they moved down the floor, and rookie guard Lindsay Barden quickly spotted the mismatch that had been there all night. 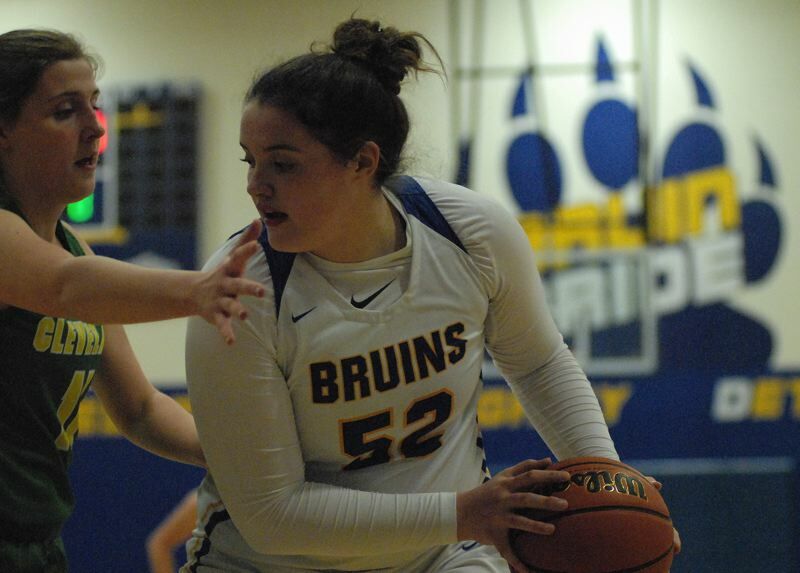 She fired a pass inside to 6-foot-3 junior center Libby Mathis, who put a left-handed layup off the glass for the winning bucket with 0:04 left to lift the Bruins to the 59-58 nonleague win. "We've talked before about if we get into that situation and we have a chance to get a good shot we want to let them go," Barlow coach Nick Hudson said. "If you call a timeout, you give the defense a chance to set up." It marked the first victory for any Mount Hood Conference girls team this preseason. The rest of the league is a combined 0-15. "After losing a close game in our opener, I felt a sense of relief after this one. I really wanted us to get that first win," Hudson said. "It's still early, we have some tough teams in our league, and I'm sure they will get rolling." Cleveland launched a deep 3 at the horn, but their desperation chance came up short. Barlow plays at a tournament in Newberg this weekend, starting at 6 p.m. Friday against Sprague. Cleveland started out with back-to-back 3s by Pytynia-Hiller and Gretta Baker to grab the early lead, but Barlow countered by going inside to Mathis for three of its first four baskets to stay within striking distance. Hannah Rispler pulled down a rebound and dribbled across half court before giving the ball up. 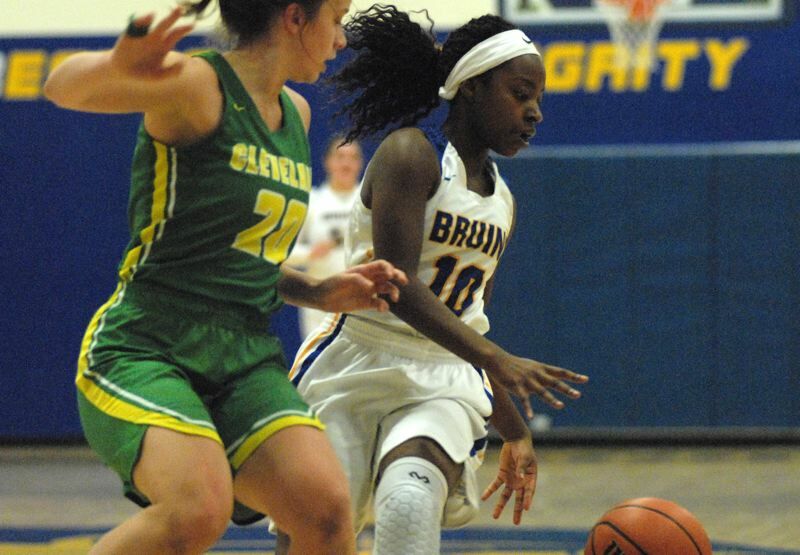 She ended up getting it back just inside the free-throw line and hit an open jumper, then chased down Cleveland's Elsie Kloeppel to block a shot on a fast break that kept the Bruins within 12-10 at the end of the first quarter. The Bruins spread the floor in the second period, at times having all five of its players outside the arc. Senior guard Monica Gifford found Barden on a backdoor cut for a layup, while Mathis spotted Rispler cutting down the middle of the lane for another easy two. Jocelyn Richardson fired a pass cross-court to find Melanie Hiu for a fast-break finish, and Richardson would sink a 16-footer off an inbounds play moments later to tie the game. Barlow took its first lead midway through the second quarter when Emory Miller drove the lane for a layup. The Bruins put on a scoring surge with Barden hitting a 3, and Miller scoring on another drive to the hoop. Whitney Waddell dribbled into the key and kicked a pass out to Maicee Bradley for another 3 — this time smack in front of the Cleveland bench. Three scores in three trips, and the Bruins were in charge 29-18 late in the first half. "We have been emphasizing motion. Make a pass and either cut or screen — create an opportunity for somebody else," Hudson said. Barlow maintained a double-digit margin into the fourth quarter before Pytynia-Hiller put on a big finish, sinking six shots down the stretch, forcing Barlow to make a last-second bucket for the win. "We felt it getting tighter and tighter, and I just kept asking the girls to play the full 32 minutes," Hudson said. Cleveland (58) — Grace Pytynia-Hillier 17, Gretta Baker 9, Lindsey Hausafus 8, Elsie Kloeppel 6, Kaiea Waiwaiole 4, Carlson, S. Kloeppel, Baumann, Lancaster. Barlow (59) — Emory Miller 17, Libby Mathis 15, Hannah Rispler 9, Lindsay Barden 8, Melanie Hiu 5, Maicee Bradley 3, Jocelyn Richardson 2, Gifford, Waddell.